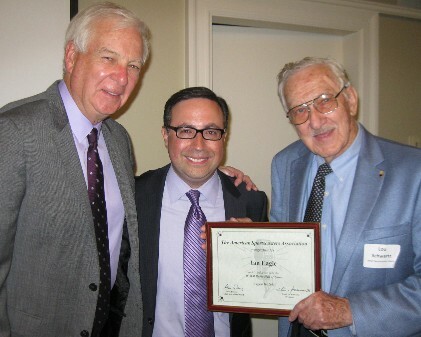 August 19, 2013 - Ian Eagle, veteran broadcaster for the YES Network and CBS Sports, was inducted into the WAER Hall of Fame on Friday August 16, 2013 at the Joseph I. Lubin House in New York City. WAER is a 50,000-watt radio station licensed to Syracuse University. A 1990 graduate of Syracuse, Eagle was the play-by-play voice of Orangemen football, basketball and lacrosse, and was awarded the Bob Costas Award for Outstanding Sportscasting. Bill Raftery, longtime college basketball announcer and ASA member, presented the Hall of Fame award to his former Nets broadcast partner and entertained the crowd with some colorful stories. Lou Schwartz, ASA President, presented Eagle, an ASA member for over 20 years, with a special certificate in recognition of his achievement. Schwartz noted that many great sportscasters such as Bob Costas, Marv Albert, Marty Glickman, Sean McDonough and Len Berman were Syracuse graduates as well as ASA members. Eagle is the fourth member of the WAER Hall of Fame, which includes Ted Koppel (ABC News), Hank Greenwald (San Francisco Giants), and Andy Musser (Philadelphia Phillies).